Thanks to the 10 hour time difference, our first day in South Africa started at about 5 AM. After unpacking and a leisurely breakfast at our hotel, we headed out to explore the city. We walked this way for a little bit, then turned around and walked that way for a little bit, then tried getting directions from the concierge at the hotel, and ended up at a massive intersection where a friendly South African asked us if we needed directions. When we tell this story to people, they laugh and say “wow, you must’ve looked really lost!” Joel will say “no, we weren’t at all” but I stand behind him and nod. It’s much funnier when we tell it in person, you’ll just have to trust me on that. 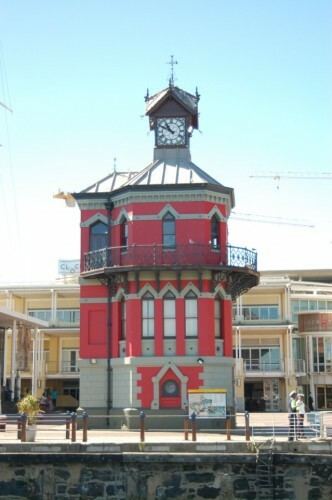 ANYway, the friendly South African pointed us in the direction of the V & A Waterfront, which is the tourist magnet – lots of restaurants and shopping. Later in the day, we met up with some of the group of Joel’s co-workers to head up to Table Mountain. A few of them had been in town a couple of days and already been, and so they were renting a car to go to the beach. Since Joel and I had just experienced South African drivers from walking the streets, driving a car sounded like the worst possible idea. We passed on that. 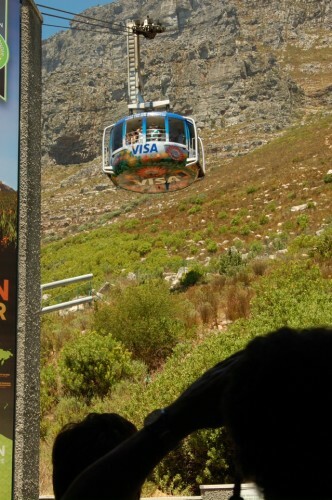 The cable car to take us to the top. We boarded the cable car and plopped ourselves directly in the front by the window so we could see where we were heading. But as the car started moving, the guide asked us to step back and keep hands and feet inside the vehicle, because the floor spun! 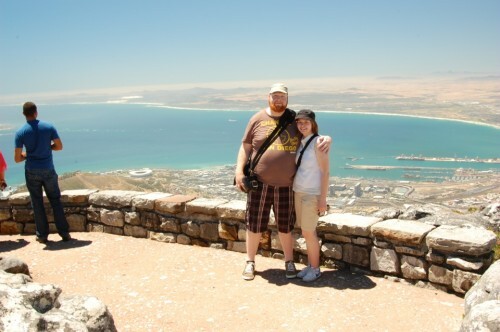 We had a beautiful view of Cape Town for a few seconds about halfway up the mountain. 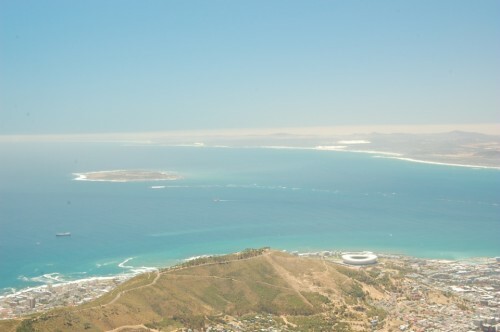 The view of Cape Town from Table Mountain. Beautiful, isn’t it? That thing that looks like a toilet seat is actually the stadium where the world cup was played in 2012. And that island in the center of the photo is Robben Island, which you’ll get to see more of, as we went there later in the week. And here we are, on top of the world. Table Mountain advertises that you can see the southernmost point of Africa from the mountain – we learned later that this is not true, but I’ll tell you, standing at the top with nothing on the horizon but water … I believed it. Table Mountain is also one of the Seven New Wonders of Nature (not the world, as I mistakenly told some of you in an email, sorry) and deservedly so. The further we walked down the trail, the better it got. The trail made a loop (about a 45 minute walk) but we decided that being at altitude at the hottest point of the day after being on a plane for 24 hours the day before and without water bottles – probably not a great idea. So, we headed back to the visitor center to snack and rehydrate. Later on, we headed back to the waterfront to find some food. 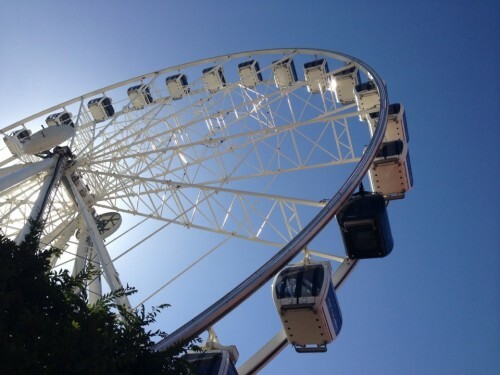 Here’s the Cape Town version of the Great Wheel – it’s called the Wheel of Excellence (great name, huh?) Joel and I decided not to ride it, not because either of us is afraid of heights or small spaces, but because we were afraid of being at the top of the ferris wheel in a small enclosed space without air conditioning. Sounds terrifying. 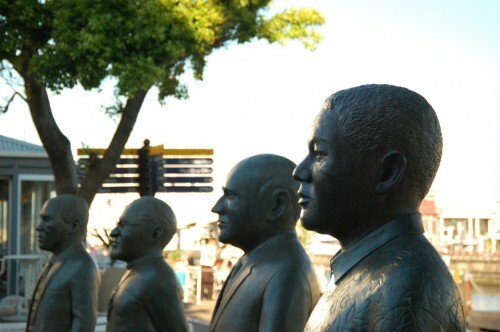 From left to right: the statues of Albert Luthuli, Desmond Tutu, FW de Klerk, and Nelson Mandela, the four Nobel Peace Prize winners from South Africa. This is Nobel Square, in the middle of the waterfront. On the ground in front of each statue is inscripted the name and a quote from each. Very cool. Read more about it here. 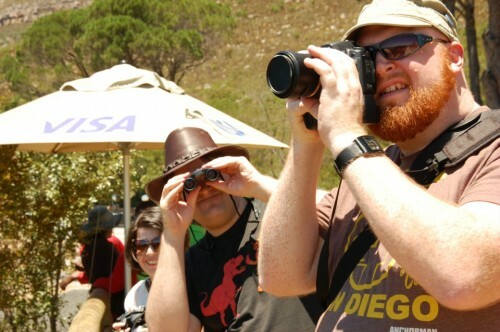 And this … well, this is how I’ll always remember Cape Town. 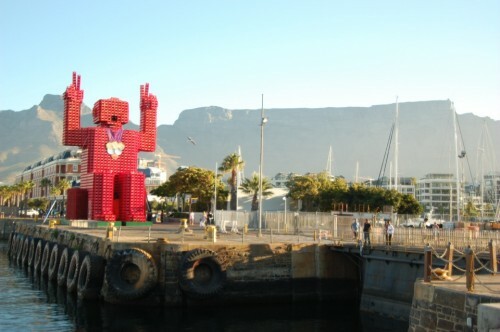 Table Mountain, the boats at the waterfront, and “big red crate guy.” It has something to do with the 2010 World Cup and is built entirely out of Coca Cola crates. To take in this view, we were sitting in front of a market that offered free WiFi – the best internet connection we could find in South Africa. We ended up spending a lot of time over the course of the week here, with big red crate guy. Come back soon, because in the next installment – penguins!